When my father Frans Sammut died in May 2011, he left a considerable amount of unpublished writings. The family has been going through them, finding at least three in book form so far, all of a historical nature. One of them, called Ġrajjet it-Tagħlim f’Malta, is being launched at the National Book Festival, under the aegis of the Education Minister Evarist Bartolo. Though his writings include different genres, Maltese critics seem to perceive my father primarily as a novelist. Personalities such as Ġorġ Mallia called him (Il-Mument, 08 May 2011) the “best author of the last 40 years of the last century”; Culture Minister Owen Bonnici, Malta’s “modern national author” (www.maltastar.com, 04 May 2011). Finding an unpublished work of a historical nature after the death of an author hailed by critics primarily as a novelist, does leave one in a difficult situation. Publish it or put it aside? I think the verb ‘to dither’ describes the ensuing situation best. Until one day I received a link to an Italian history of law e-journal which carried an article about the legislative impact of the French occupation of Malta. It was a remarkable essay penned by French professor Anne-Marie Mésa who, I discovered, teaches history of law, post-French Revolution and contemporary political history, history of political ideas, and history of commerce at the University of Reims Champagne-Ardenne. Now my father had written extensively about Napoleon Bonaparte’s six-day stay on Malta in June 1798. His book Bonaparti f’Malta, published in the late 1990s, was translated in 2008 into French as Bonaparte à Malte. I decided to send Mésa a complimentary copy of this book, so she might use it in her future research. I expected a note of thanks, not more. Instead, the French Professor wrote me a page-long letter in which she said that my father’s “point of view is actually original, well reasoned out, nuanced and subtle – as one would expect from all works on history. A true pleasure to read”. She formed the opinion that my father was “self-evidently an excellent historian, as well as a rich personality and endowed with a vast culture”. Mésa knows Malta – she corresponded with French-period expert Carmelo Testa up till his demise in 2006. But since she is outside our national milieu beleaguered by Lilliput politics, her comments were the wind needed to fill the sails of our small publishing project: Ġrajjet it-Tagħlim f’Malta, L-Ewwel Volum. 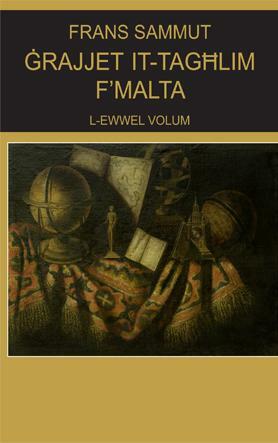 The book offers a long-term history of education in Malta, starting from the rule of the Arabs down to the mid-19 th century. There had to be a Volume Two, which we still have not found. To my mind, it is written in the tradition of the French School of Annales, particularly since it focuses on the mentalités, or psychology, of the epochs under study. As could be expected, Mikiel Anton Vassalli’s ideas on education feature prominently. Given that this is the 250 th anniversary of Vassalli’s birth, it is befitting that the book is being published this year. Ġrajjet it-Tagħlim f’Malta is being launched on Friday in the Sir Temi Zammit Hall at the Mediterranean Conference Centre, Valletta. There will be a short discussion among a panel consisting of (in alphabetic order) Education Minister Evarist Bartolo, Joseph M Brincat, Raymond Mangion, President Emeritus Ugo Mifsud Bonnici, Alfred Sant and Charles Xuereb. Soprano Joan Mangion will sing an aria (lyrics by Frans Sammut, music composed for this event by Ray Sciberras). The book will be sold at a discounted price.